Even before the kingdom of Golconda rose in prominence, the beginning of the fort was thought to be in 1143, when the Kakatiya Dynasty ruled the region. According to legend, a shepherd boy found an idol in the area. When this was reported to the Kakatiyan king, he ordered a mud fort to be built around it. The fort eventually became known as Golla Konda, which in Tegulu meant Shepherd’s Hill. The area eventually became a heated battleground between three kingdoms, finally culminating in the victory of the Islamic Bahmani Sultanate and the fort became a capital of a major province of the Sultanate. When Quli Qutub Shah declared his independence from the Bahmani Sultanate in 1518, the Qutub Shahi Dynasty arose and Golconda became its seat of power. Over the next couple of decades, successive Qutub Shahi kings expanded the mud fort into a massive and expansive fort of granite, with a circumference that extended to around 5 kilometers. The fort remained to be the dynasty’s capital until it was moved to Hyderabad in 1590. The fort was then expanded to have a 10-kilometer outer wall that enclosed the city. 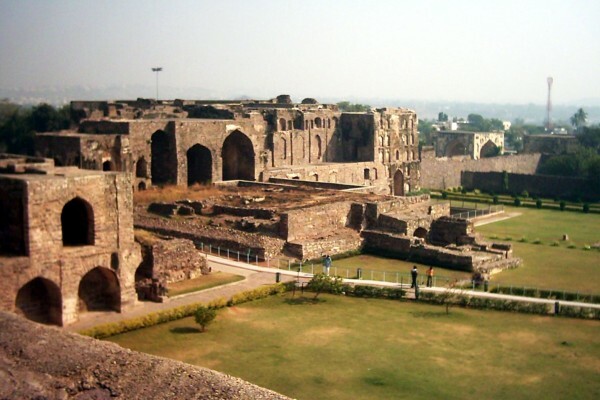 In 1686, the Mughal prince Aurangzeb started to lay siege on the fort of Golconda, with the intent of claiming Hydebarad, the wealthy capital of the Qutub Shahi dynasty. The fortress proved to be as impregnable as its reputation claimed. It wasn’t until the year after, in 1687, when Aurangzeb finally managed to breach the fort after a nine-month long siege. It was said that the fort only fell down because of a traitor who sabotaged the gate. Today, even after almost 800 years, the fort still stands as one of Hyderabad’s greatest architectural wonders. One of it’s gratest engineering marvels is the fantastic acoustic effects: one handclap at a certain point below the entrance dome can be heard at the highest point of the pavilion almost a kilometer away. This was said to be used for warning the royals in case of an attack.